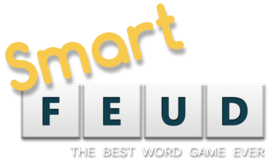 Thank you for loving SmartFeud. You can buy the app by clicking on the ‘Buy SmartFeud’ button within the app. If you buy SmartFeud you will not see any advertisements anymore. Plus, you can play in professional-mode! If you invite your friends to play in professional-mode think twice before you finish your turn! If a word on the board is not in the dictionary, you will lose your turn, and it’s up to your opponent to make a brilliant move.